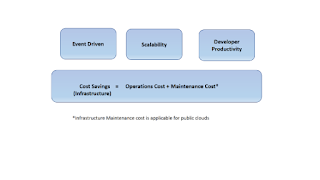 There are many tools and frameworks available for provisioning infrastructure on the cloud. One of the most popular cloud agnostic tool is Terraform. It is a vital piece of Infrastructure as a Code Service and could be used to tear up or tear down infrastructure. We will learn about some basic nuances of Terraform in this post. Terraform could be installed by finding the appropriate package and following instructions. (Refer https://www.terraform.io/intro/getting-started/install.html). In this post, I will be using Terraform on CentOS. Let us try to get our hands dirty. Create a directory, 'scripts' and cd into that. Run 'terraform --version' to confirm if terraform is successfully installed. Let us create our first terraform file. Terraform files have an extension of .tf. So, create a file 'first.tf'. Let us create a variable called 'name' and try to print it out. Note the syntax, the variables should be referred with a prefix 'var' and variables can have default values. Before we can start running this file, we need to initialize terraform. Terraform init is used to initialize a new or existing Terraform configuration. Now, to run this file, we need to create a plan first. A plan generates and shows an execution plan. It is always advisable to create a plan as it gives an opportunity to review what resources are being created. We will save the plan to a file and then apply changes using the plan. "Apply complete! Resources: 0 added, 0 changed, 0 destroyed." Providers are responsible in Terraform for managing the lifecycle of a resource. i.e creating a resource or updating it etc. There are a lot of cloud providers which are implemented by Terraform. It supports AWS, Google Cloud to name a few. Note that we are trying to create a EC2 instance of type t2.micro and tagged as 'my-vm-automated'. Note that before creating a plan file, we need to run 'terraform init' again. When we ran it first time, the provider was not there and when we change or add a provider, we will need to initialize again. Create a plan file and apply the plan file. You will see that terraform will show what resources are being created. "Apply complete! Resources: 1 added, 0 changed, 0 destroyed." When you apply changes, you would notice that a 'terraform.tfstate' file is created. This file is used by terraform to save the current state of the infrastructure. This is used when we run subsequent files and hence terraform will know what changes to apply. You will get a message indicating, the plan is older than the current state and cannot be run. Terraform gets this insights through the terraform.tfstate file and verifies if the plan is latest. If not, it will not run the plan. Now let us try to simply apply the terraform files. We will see that the no resources are added or deleted, since we have not made any changes to terraform file. Now login to AWS console and verify that the EC2 instance is created. Run the command 'terraform destroy'. Once you confirm, it will delete the EC2 instance created. Update the above configuration to refer to that key pair. Next time you want to create an infrastructure on AWS, resist the temptation of using AWS CLI or GUI....Happy Terraforming! !